I was on RTÉ Radio 1’s cultural show Arena discussing the life and career of American writer Ursula K. Le Guin on the first anniversary of her death. I’ve been nominated in the Irish Comic News Awards 2018 in the Best Irish Writer (Major Publisher) category, for my Judge Anderson script for the 2000 AD Summer Sci-Fi Special magazine. The comic book narrative I created at the Womarts Illustrators & Comics Residency in Angoulême, France is part of a roaming international exhibition, and its first showing will be in Maribor, Slovenia from 26 April – 1 June 2019. I was on Arena, RTÉ Radio 1’s culture show, talking about George R.R. Martin‘s latest book: the 700-page Goliath called Fire and Blood, Volume 1. I’ve written a story for the comic book anthology, Mansion Of Madness, which is edited by Lee Robson and Dan Hill, called ‘Words Are Not Real’, with art by Alex Patterson, and lettering by Bolt-01. You can buy it on ComiXology now. I’ll be attending ComicCity – Comics & Creative Arts Festival in Derry on 27 October 2018. I’m attending the Fantasycon weekend in Chester, England from 19-21 October 2018. My schedule of panels is online. I wrote a piece about Enniscrone and surrounding locations in Co. Sligo – an area I’ve repeatedly returned to since I was a child – for the Touring Tuesdays section of the Dublin 2019 Worldcon blog. I’ve been selected to be part of a special 10-day group residency in Angoulême in France, as part of one of the initiatives of a Creative Europe Project called Wom@rts. Bone Mother, the stop-motion animated short film by Dale Hayward & Sylvie Trouvé, based on my short story, will have its World Première at Festival Stop Motion in Montreal. I’ll be a guest at the inaugural Omagh Comic Fest, taking place in the Strule Arts Centre, Townhall Square in Omagh on 8 September 2018. I’ll be conducting Q&As after the screenings of three films at the Galway Film Fleadh this year: Possum, Holiday, and Bill & Ted’s Excellent Adventure. Details here. My book about David Lynch’s Twin Peaks: Fire Walk With Me has been nominated for a BFS British Fantasy Award in the Best Non-Fiction category. I’ve been on the RTÉ Radio 1 arts and culture show, Arena, twice recently: on Monday, 25 June I was discussing the 2000 AD Special Sci-Fi Magazine, and on Monday, 2 July I was reviewing the new Cambridge Companion To The Graphic Novel. I’ve written a Judge Anderson story called ‘SPA Day’, drawn by Emma Vieceli, coloured by Barbara Nosenzo, and lettered by Ellie De Ville for the 2000 AD Summer Sci-Fi Special magazine, which is out now. I’m interviewed on The Thin Air by Loreana Rushe, where I discuss comics, influences, and in particular my forthcoming work for 2000 AD. I’ll be writing a strip for the 2000 AD Sci-Fi Special, which will be published on 20 June 2018. The inaugural episode of the Hammered podcast is now available for listening. The host of the series, JG Byrne, and I talk about The Quatermass Xperiment (1955). I’ll be one of the regular guests in an on-going podcast called Hammered, dedicated to examining the more ghoulish output of the British Hammer Film Productions studio, hosted by J G Byrne. At the Junior Film Fleadh in Galway on 11 November I’ll be giving a workshop on Adapting Your Voice: Tailoring Stories for Various Media. My short story ‘Y’ is appearing in issue 1 of Eyedolon (‘Toward a Weirder Tomorrow’), a new online anthology series from Broken Eye Books, edited by Scott Gable. I was on a segment of The Kitchen Table show on 103.2 Dublin City FM on 26 October, discussing Supergirl and Mindhunter, as well as the forthcoming Slayers and their Vampires panel at the Bram Stoker Festival. The Jennifer Wilde point & click adventure game, based on the comic book series I wrote which was published by Atomic Diner Comics, has been fully funded on Kickstarter. You can listen online to me on RTÉ Radio 1’s arts show, Arena, talking about Philip Pullman’s work, and his new book in His Dark Materials series: The Book of Dust – La Belle Sauvage. As part of the Bram Stoker Festival in Dublin (27-30 Oct), I’ll be taking part in the Slayers and their Vampires panel from 1 pm – 2.30 pm on 28 October, in the Albert Lecture Theatre, Royal College of Surgeons in Ireland. My poem, ‘Submerged’, is in issue 4.2 of Mythic Delirium. I’m on The Hopscotch Friday Podcast discussing my book on Twin Peaks: Fire Walk With Me, and the new series, Twin Peaks: The Return. I’m discussing Marvel’s The Defenders on RTÉ Radio 1’s culture show, Arena, on Tuesday, 15 August. I’ll be presenting the Hugo Award for Best Graphic Story at the Hugo Awards Ceremony in Helsinki at Worldcon 75 on Saturday, 12 August. I’m reviewing the new novel, Borne, by Jeff VanderMeer, on RTÉ Radio 1’s culture radio show, Arena, on Thursday, 10 August. I’ll be interviewing Artist Guest of Honour, Claire Wendling, at WorldCon 75 in Helsinki at noon on Friday, 11 August in Messukeskus, Room 103. My Midnight Movie Monograph of the cult film, Twin Peaks: Fire Walk With Me, for Electric Dreamhouse Press, an imprint of PS Publishing, is now available to buy online. I’ve posted my schedule for WorldCon 75 (9-13 August) in Helsinki, Finland. I’ll be attending, and speaking, at the Animate Europe: Awards ceremony and exhibition at the Centre Belge de la Bande Dessinée in Brussels on 11 July. I appeared on The Culinary Muse radio show on Kinvara FM, hosted by Anna O’Donnell, to chat about vegetarianism, as well as playing some themed music on the subject. My short story ‘Impossible to Feign’ will appear in the Walk on the Weird Side anthology, edited by Joe Pulver, which will be launched at NecronomiCon in Providence. I’ve written a Midnight Movie Monograph on the cult film, Twin Peaks: Fire Walk With Me, for Electric Dreamhouse Press, an imprint of PS Publishing, under the management of editor Neil Snowdon. The book will be released in June 2017. My story ‘Colours’, drawn by John Riordan, is in the Outside comic book anthology, published by Pure Ash Press. I’ll be part of a panel discussing ‘The Power of Superheroes‘ at the Galway International Arts Festival, at 4pm on 22 July in the O’Donoghue Theatre in NUIG. I reviewed the graphic novel adaptation of Octavia E. Butler’s classic novel, Kindred for RTÉ Radio 1’s programme Arena. I’m part of the jury for the 2017 Animate Europe comic book competition, organised by Friedrich Naumann Foundation for Freedom. I collaborated with artist Pablo Clark for a one-page piece of artwork for Alison Sampon & Ian MacEwan’s on-going project: Think of a City. I describe the process on a blog post. I’ll be attending FantasyCon by the Sea in Scarborough and participating in two panels and an anthology book lauch on 24 September 2016. My short story ‘The Fruit of the Tree’ will be in the Ten Tall Tales anthology, edited by Ian Whates, published by NewCon Press. It will be launched at Fantasycon in Scarborough on 24 September 2016. I’ll be writing the script for the Jennifer Wilde computer game, developed by Outsider Games in partnership with Atomic Diner Comics and Northern Ireland Screen, and is based on the original comic book series I wrote for Atomic Diner. My short story ‘A Rebellious House’ will be in The Madness of Dr. Caligari anthology, edited by Joe S. Pulver, and published by Fedogan and Bremer, due out autumn 2016. I’ll be giving a lecture for the Miskatonic Institute of Horror Studies in London from 7pm – 10pm on 8 December 2016, in the Horse Hospital, Colonnade, Bloomsbury, London WC1N 1JD. The title of the talk is: ‘Working the ‘Blue Rose Case: Signs, Codes, and Mysteries in David Lynch’s Fire Walk With Me‘. Cassilda’s Song: Tales Inspired by Robert W. Chambers King in Yellow Mythos, edited by Joe S. Pulver, has been nominated for a World Fantasy Award in the Anthology category. My story ‘Family’ is in the volume. I’ll be a guest at the inaugural Horror Expo Ireland event, which is taking place at the Freemasons Grand Lodge of Ireland in Dublin on Sunday, 30 October 2016. I’ll be a guest at the Dublin Ghost Story Festival, which is taking place from 19 – 21 August 2016, at the Freemason Grand Lodge of Ireland in Dublin. I’ve co-curated a stream of programming in the Hay Festival, Kells (23 – 26 June), with technology journalist Karlin Lillington, called ‘The Image’. Emma Newman invited me to appear on an episode of her (and Peter Newman’s) podcast, Tea and Jeopardy. I’ll be speaking at the two hundred and forty sixth Inaugural meeting of The Hist in Trinity College Dublin, on the subject of ‘Making the Modern Heroine’. My short story ‘Spooky Girl’ will be appearing in a forthcoming anthology from Fox Spirit Books, called Respectable Horror, which is edited by Kate Laity. My short near-future play, The Love of Small Appliances, has been selected by the Waking the Feminists West team, to be part of their New Play Reading, taking place on 6 May in the Town Hall Theatre, studio, in Galway. I appeared on Arena – RTÉ Radio 1’s Arts & Culture show – during its 1 March broadcast, discussing the Fête de la Bande Dessinée, the Irish / French Comic Book Festival in Dublin. My story, ‘The Light at the Centre’, will appears in Uncertainties: Twenty-Two Strange Tales, edited by Brian J. Showers for Liberties Press in Ireland. ‘Territory’, a story written by Julie Steinbacher, is on Podcastle – I read the story, along with Kim Jones, for the podcast. My short story ‘Moments on the Cliff’ will appear in issue 41 of the Galway literary magazine Crannóg. I’ll be at its launch at 6.30 pm on Friday, 26 February at the Crane Bar, Sea Road, Galway. I’ll be a guest at the Fête de la Bande Dessinée – Comic Book Festival on 2 March, at the Mart Firestation, 190a Rathmines Road Lower, Dublin 6. My story ‘Zel and Grets’ will appear in the forthcoming anthology The Grimm Future, edited by Erin Underwood. My short story ‘Valerie’ will be reprinted in Obsidian: A Decade of Horror Stories by Women, published byNewCon Press. I’ve been shortlisted for the The Geekies 2015 – the Geek Ireland Awards – in the Best Irish Writer category. I won the Best Irish Writer Published Outside of Ireland, in the ICN Awards 2015. I’ll be part of a panel discussion after the rehearsed reading of Kneale’s lost drama The Road at the Horse Hospital, London from 7pm – 10pm on 10 December, organised by Miskatonic Institute of Horror Studies. I’ve been nominated for the Best Irish Writer Published Outside Ireland Award in the ICN Awards 2015. I’ve written a script for a short comic that will detail the origin story for Lola Vita, a character from Wailing Heights, a new video game forthcoming from Outsider Games. It’s being drawn by Ron Salas (Marvel Comics, Dark Horse, DC Comics). At 8pm on Thursday, 15 October Kim Newman and I will be talking about ‘Things That Go bump in the Night… and why we love them!’ at the Riverbank Arts Centre as part of the Kildare Readers Festival 2015. I have an article in the non-fiction anthology, We Are The Martians: The Legacy of Nigel Kneale, which is edited by Neil Snowdon and published by Spectral Press. Delcourt has published a French translation of Witchfinder Volume 3: Les Mystères d’Unland. My short story ‘Family’ is in Cassilda’s Song, an anthology of stories inspired by Robert W Chambers The King in Yellow mythology, and edited by Joe S. Pulver. The book will be published by Chaosium Inc. in time for the 2015 NecronomiCon Providence convention in August. I edited the Song of the Sea picture book, which is written by Will Collins, based on his screenplay of the animated film, which was directed by Tomm Moore for Cartoon Saloon. It’s available from the web site, and suitable for ages about 7 and up. I’ll be a guest at the ComicCity Festival of Comics, Illustration, and Storytelling, in the Millennium Forum, Derry/Lononderry from 12-13 September, 2015. I’ll be discussing Neil Gaiman’s latest short story collection, Trigger Warning: Short Fictions and Disturbances, on RTÉ Radio 1’s culture show, Arena, this Monday, 9 March, at some point between 7pm – 8pm. Kim Newman & I will be signing copies of the trade paperback collection of Witchfinder: The Secrets of Unland, in Forbidden Planet in London, on 15 April. I’ll be a guest at the Cork Comic Expo in Mahon Point on 25 April, 2015. I won Best Irish Writer (comics) in the Arcade Awards. My short story ‘Bone Mother’ is being adapted as a short stop-motion animated film by Sylvie Trouvé and Dale Hayward (See Creature animation company), and produced for the National Film Board of Canada by Jelena Popovic. I’ve been nominated for Geek Ireland’s Best Irish Author of 2014 (comic books). The next Laydeez do Comics meeting is taking place on Saturday, 29 November in the Odessa Club in Dublin. Our speakers are: C.E. Murphy, Philip Barrett, me, and Paul Bolger. I’ll be Guest of Honour at Octocon 2015, which is taking place in the Camden Court Hotel from 10 – 11 October 2015. I’ll be In Conversation with Posy Simmonds at the British Comic Awards ceremony at 6pm on Saturday, 15 November at theThought Bubble Sequential Art Festivalin the Bury Theatre, Royal Armouries, Leeds Dock. I’ve been nominated in two categories for the Irish Comics Awards, 2014. For the Think of a City exquisite corpse storytelling project I’ll be collaborating with artist Marguerite Sauvage. Our contribution will be out in late 2015. I’ll be doing a signing at the Dark Horse Comics Booth (1636) at New York Comic Con on Sunday, 12 October, from 12pm – 12.50pm if you want any comics signed. I’ll be Skyping in to the London meeting of Laydeez do Comics in Foyles, on 1 July, 2014. I’ve been nominated for a British Fantasy Award in the Best Comic/Graphic Novel category for my writing on the Jennifer Wilde mini-series Unlikely Revolutionaries, along with artist Stephen Downey, and writer Karen Mahoney (who wrote the stand-alone JW story The Wilde Hunt). The comics were published by Atomic Diner Comics in Dublin. I’ll be signing issue 1 of Witchfinder: The Mysteries of Unland at Sub-City Comics at its new location at 62 Dame Street, Dublin, Ireland 2, on Saturday, 21 June from noon – 4pm. 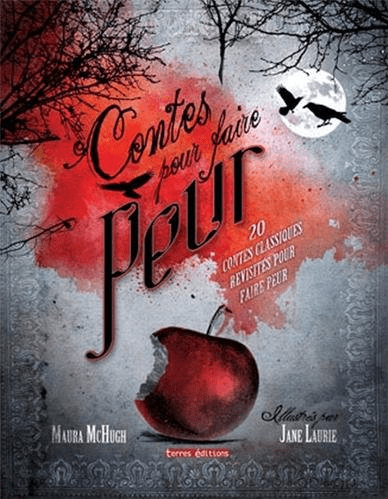 A paperback edition of Twisted Fairy Tales is available in France, titled Contes pour faire peur, which is translated by Marie-Paule Zierski. My short story ‘Bone Mother’ has been optioned by the National Film Board of Canada’s Animation Studio with the view to make a short stop-motion animated film, which will be adapted and directed by Sylvie Trouvé and Dale Hayward, and produced for the NFB by Jelena Popovic. I’m going to be a guest at D.I.C.E. (Dublin International Comic Expo) – 27 – 28 September, 2014 in Dundrum, Co. Dublin. I reviewed MCM Ireland Comic Con for the Forbidden Planet International blog, which has photos I took at the event. I recently appeared on RTÉ Radio 1’s arts show, Arena, offering a preview of the inaugural MCM Ireland Comic Con in Dublin. I’ll be a guest at an event called Irish Comics Chat, which will take place at the Rua Red arts centre in Tallaght in Dublin from 12.30pm – 6pm on Saturday, 29 March. I’m very pleased to announce that I’m co-writing a comic book mini-series with Kim Newman which is part of the Hellboy universe created by Mike Mignola, and published by Dark Horse Comics. My short story ‘Valerie’ will appear in the anthology La Femme, edited by Ian Whates from NewCon Press, due out in April. Writer Ray Cluley analyses my short story ‘Water‘ on This is Horror. I’ve written a new Jennifer Wilde short comic book story that is being drawn by Leeann Hamilton. It will be in full colour, and posted online during the summer. 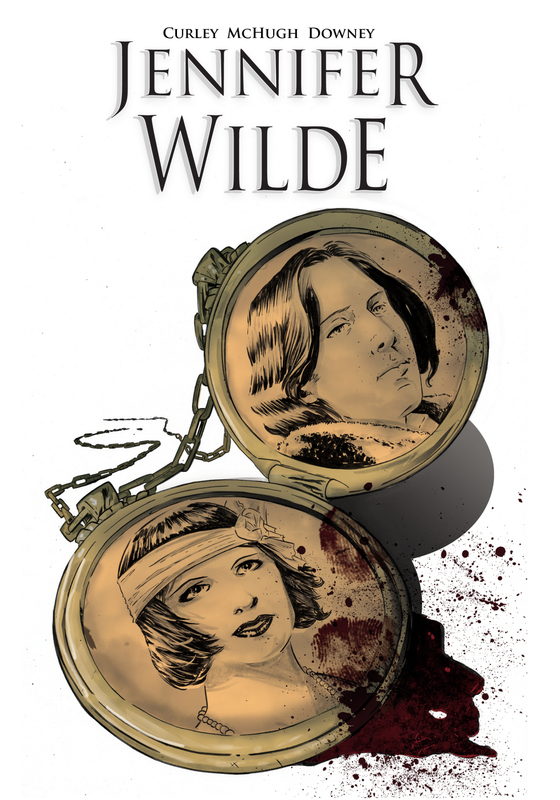 Issue 1 of Jennifer Wilde: Unlikely Revolutionaries is now available to buy on ComiXology. The Women Write About Comics web site announced their annual awesome awards, and I was short-listed in the Geek Feminist category. My short story ‘The Hanging Tree’ is published in issue 38 of horror magazine Black Static. I’m nominated in the Best Irish Writer category in The Arcade Awards. I’ve been nominated for a 2013 ICN Award in the ‘Best Irish Writer Published Outside of Ireland’ category. The next meeting of Laydeez do Comics – Dublin will happen from 2.30pm – 5pm on Saturday, 30 November, 2013, and will feature guests Leeann Hamilton, Michael Carroll, and Gareth Gowran & Sadhbh Lawlor. My collection Twisted Myths was published in the USA by Barron’s Educational Series on 1 October, 2013. It’s a 144 page large-size hardback, containing twenty myths from around the world with illustrations by Jane Laurie. It’s available to buy on Amazon.com. The next meeting of Laydeez do Comics – Dublin will happen from 7pm – 9.30pm on Wednesday, 11 September, 2013, and will feature guests Sarah Bracken, Paddy Lynch, and Arja Kajermo. At 4.30pm on Saturday, 3 August at the Lighthouse cinema there will be a screening of Kristy Guevara-Flanagan documentary Wonder Women! The Untold Story of American Superheroines. Following which I’ll be appearing on a Banter panel discussing pop culture’s representation of women on screen and in print with Irish Times journalist Jim Carroll, director Kristy Guevara-Flanagan, and Film Fatale’s Anna Taylor. I’ll be a guest at this year’s Octocon in the Camden Court Hotel from 12 – 13 October. Issue 3 of Jennifer Wilde has been published by Atomic Diner, and it can be ordered ordered online. I’ll be a guest at 2D, the Northern Ireland Comics Festival, which is happening from 30 May – 2 June in Derry. Writer Lynda Rucker and I are setting up Laydeez do Comics – Dublin. The first meeting will be on 7pm – 9.30pm on Wednesday the 22 May, 2013 in the Rooftop Bar, 3rd floor, of the Odessa Club, 13 Dame Court, Dublin 2. Our guests are: Sarah McIntyre, Alan Nolan, and Maeve Clancy. I’ve written a short piece called ‘From Fan to Con-runner to Writer – different experiences of conventions’ for issue 15 of the fanzine, Journey Planet. I’ve been asked to be one of the Special Guests at ArcadeCon 2013, which is taking place from 5 – 7 July in the Ballsbridge Hotel, Dublin. I’ve written an article for UK web site, Bad Reputation in honour of Women in Horror Month, called ‘More Women In Horror for 2013‘. On 1 February, 2013 Twisted Fairy Tales was published in the USA by Barron’s Educational Series. It’s a 144 page large-size hardback, containing twenty classic fairy tales retold with a dark slant, accompanied by lavish illustrations by Jane Laurie. It’s available for order on Amazon.com. I contributed to Paul Cornell’s Twelve Blogs of Christmas, and wrote about Twelve Drummers Drumming, in which I give a brief overview of the history of women drummers. At noon on Thursday, 8 November, 2012 I’ll be on the jury of the Script Pitching Competition, for the Galway Junior Film Fleadh, in the Town Hall Theatre. Best of luck to the short-listed candidates! After the closing performance of The Hallowe’en Sessions on November 3rd in London, there will be a Q&A with all the writers. Two nights are sold out already so get your tickets while you can. At the Octocon science fiction convention I’ll be on the jury of The Golden Blasters Short Film Competition. I’m attending FantasyCon in Brighton (27 -30 September), and will be co-presenting the Comic Book/Graphic Novel Award at the BFS Awards ceremony. My short story collection, Twisted Fairy Tales, will be published by Barron’s in the USA in Spring 2013, featuring lavish illustrations by Jane Laurie. I’ve written part of an anthology play called The Hallowe’en Sessions, which will have a run in the Leicester Square Theatre, London, from 29 October – 3 November, 2012. Issue 2 of Jennifer Wilde, is now on sale, and can be purchased via the Atomic Diner web site. Jennifer Wilde, the comic book I write for Atomic Diner, has been short-listed for an Eagle Award in the Favourite European Comic Book category. Voting is open now. On the Forbidden Planet International blog I review Irish artist/writer Leann Hamiliton’s self-published comic Finn & Fish. I’m a member of the jury for the 2012 British Fantasy Awards. I reviewed the graphic novel anthology, Jim Henson’s The Storyteller, volume 1, published by Archaia Entertainment on ComicBuzz. On ComicBuzz I reviewed Underwire, a collection of cartoons by Jennifer Hayden, and published by Top Shelf Productions. 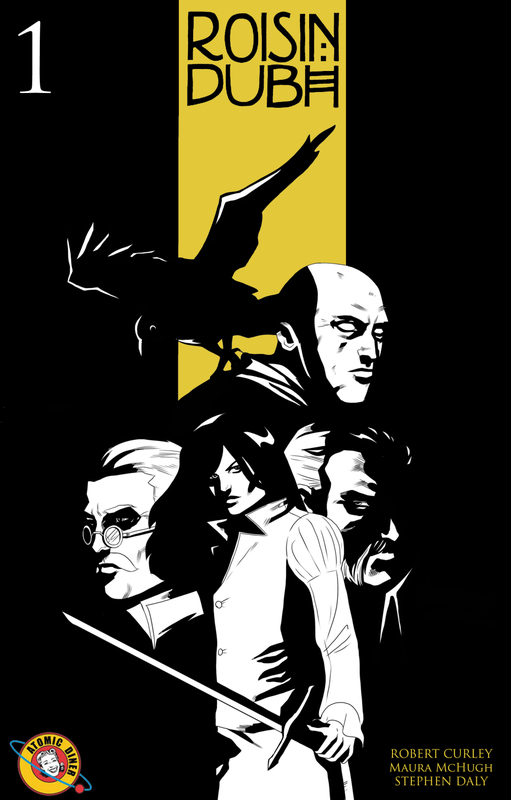 I’ve reviewed the graphic novel Hector Umbra, written and drawn by Uli Oesterle, and published by Blank Slate Books on ComicBuzz. Stephen Byrne, Robert Curley & I will be signing copies of Róisín Dubh in the Library Bar, Central Hotel, Dublin from 7pm onwards on the 17 February. I’ll be a guest at Epic Con in Maynooth along with Róisín Dubh teammates Stephen Byrne and Robert Curley on the 18 February, 2012. I’ll be a guest at the Hi-Ex: the Highlands International Comic Expo in Inverness, Scotland from 31 March – 1 April. I offered my choices in the ‘Best of 2011’ series of posts on the Forbidden Planet International blog. Issue 2 of Róisín Dubh, the comic book series I’ve written for Atomic Diner Comics, is on the shelves of comic book shops now. I’m one of the judges of the Young Filmmaker Short Film Competition (for ages 13+) at the Galway Junior Film Fleadh, 2011. I’m a member of the jury for The Shirley Jackson Awards 2011. I’m at guest at Octocon, the Irish national science fiction convention, in the Camden Court Hotel in Dublin, from 15-16 October, 2011. I’ll also be on the jury of the Golden Blasters Short Film Awards. Issue 1 of my comic book series, Jennifer Wilde, is on sale in Sub-City Comics in Dublin and Galway, as well as other shops in Ireland and the UK, and can be purchased online. My review of Lucille, the graphic novel by the artist/writer/singer Ludovic Debeurme, appeared on the Forbidden Planet International blog. My short script, ‘The Nail’, will appear in the Womanthology comic book anthology, which is due from IDW Publishing in December. Star St. Germain is the artist assigned to the script. I reviewed of the first deluxe edition of the post-apocalyptic comic book series Y: The Last Man for the UK Feminist web site The F-Word. I’m one of the women featured in The Irish Times article called “The brave new world of comic-book heroines“, written by Sinéad Gleeson. I answered a quick-fire round of questions on the Irish Comic News web site. I’m a guest at Squarebound, the one-day Irish Comics Creators’ Convention, on Saturday, 18 June 2011. I’ll be attending Derry’s 2-D Comic Book Festival (2 -4 June, 2011), and issue 1 of Róisín Dubh will be on sale all day on Saturday. I was interviewed on the UK Feminist web site Bad Reputation about Róisín Dubh. You can read part one and part two on its web site. Issue 1 of my horror comic book series, Róisín Dubh, is now on sale in Sub-City Comics in Dublin, and can also be purchased online. Voices from the Past is a new e-anthology of flash fiction edited by Scott Harrison and Lee Harris from their fledging imprint H&H Books. My short story ‘Mustn’t Grumble’ is part of the Table of Contents. 100% of the proceeds will be donated to Great Ormond Street Children’s Hospital. I’ve written a blog post for the Irish women’s web site, The Anti-Room, called ‘Fly in the Foundation’. The podcast of my short story ‘Vic’ is now live on Dark fiction Magazine in its latest issue titled ‘The Waste land’. University College Dublin’s Sci-Fi society is hosting a one-day convention called FanSciCon on April 15, and I’ll be attending as a guest. I’m a guest at PCon VIII in the Central Hotel in Dublin from March 4-6, 2011. I wrote an article for UK web site, Bad Reputation, for Women in Horror Month, called ‘Women in Horror: Five Recommended Writers‘. My interview with Canadian horror writer Gemma Files is live on the Black Static Case Notes Blog. My flash short story, ‘Water’, is appearing in Black Static 21. For the Salon Futura magazine I participated in a podcast about the 2010 graphic novels and/or comic book series that are eligible for the Hugo for Best Graphic Story. Issue 35 of Theaker’s Quarterly Fiction is now out and it includes my short story ‘Involuntary Muscle’. I’ve reviewed World of Warcraft‘s expansion, Cataclysm, for the Hi-Ex! Blog, and written a blog post about it. My short story ‘Vic’, which recently appeared in the Year’s Best Dark Fantasy and Horror 2010, will be podcast in the April edition of Dark Fiction Magazine. A story of mine will appear in an anthology of flash fiction, entitled Voices from the Past. The anthology will be sold through all major eBook outlets, with 100% of the proceeds benefiting Great Ormond Street Children’s Hospital. There is more information about the project on my blog. I’m guest reviewing for Peter Tennant on Black Static‘s Case Notes Blog, where I discuss the new audio drama ‘Is This Seat Taken?’, written by award-winning horror writer Sarah Langan (Audrey’s Door, The Keeper), which is part of a new series of horror audio drama by Tales from Beyond the Pale. I’ll be a guest at the Wexworlds Sci-Fi and Fantasy Festival from 26-28 of November, 2010 in Wexford town. Congratulations to Emma Finnerty, whose pitch for ‘Web of Lies’, won the Script Pitching Competition at this year’s Galway Junior Film Fleadh. I was part of the jury, and blogged about the event. My short story ‘Involuntary Muscle’ will appear in issue 35 of Theaker’s Quarterly Fiction, which is due out at the end of November. Year’s Best Dark Fantasy and Horror 2010, edited by Paula Guran, is now available to buy at Amazon.com. It contains my short story ‘Vic’. A full list of the table of contents is on my blog post about the anthology’s release. I’ll be a guest at the 2010 Octocon convention in the Camden Court Hotel, Dublin, from 16-17 October, where I’ll be on the Jury for the Golden Blaster Awards for best sf short film. I’ll be a member of the jury for the pitching competition for the 16th Galway Junior Film Fleadh (3 – 6 of November 2010). The deadline for entries is Wednesday 13th October 2010. There are more details about the competition and how to enter on my blog. Issue 18 of Black Static is out now. It features the second batch of winning stories from the Campaign for Real Fear. Black Static, issue 17, has gone to the printers and should be available by June 11th. It contains the first group of ten winning stories from the Campaign for Real Fear, selected by Christopher Fowler and I. My short story ‘Vic’ will appear in Year’s Best Dark Fantasy and Horror 2010, edited by Paula Guran. It’s Irish Free Comic Book Day this Saturday, May 15. Comic book fans can get a free copy of the preview issue of Róisín Dubh if they’re quick! My photograph, entitled “Soho Ghost”, is a top ten finalist in the Cities of Night contest, being run by ChiZine Publications. You can read my blog post about the competition. I’ve launched a new design of my web site with more up-to-date information about my projects, past and present. Christopher Fowler and I have announced the top twenty winners, and seven Honourable Mentions, in the Campaign for Real Fear Competition we organised. The first batch of ten stories will be published in the June issue (#17) of Black Static followed by the second group of ten stories in the August issue (#18), and they will be podcast by Action Audio. Chris and I will publish feedback and analysis on the competition in the June issue of Black Static, and afterwards on our blogs. My poem, “The Solace of Dark Places”, is now live on Goblin Fruit. The issue features an audio recording of me reading the poem. I received four honourable mentions from Ellen Datlow (for 3 stories and 1 poem) during her reading for her Best Horror of the Year, Volume two. During February through to April 2010 I was interviewed weekly for “Arts Brew”, on the Internet Radio Z103, about cultural events in Ireland. This year’s Eastercon, Odyssey 2010, is going on in Heathrow, London from 2-5 April 2010, and I will be at the convention and moderating a number of panels. Please check out my schedule on my blog. I’m attending the World Horror Convention in Brighton, UK from March 25-26, 2010 and I’ll be moderating a panel discussion on Women in Horror. My short story “Vic”, published in Black Static #10, is on the long list for The British Fantasy Society’s Awards in the “Best Short Story” category. I’ve launched a web site for Róisín Dubh, the graphic novel I’ve worked on with Rob Curley and Stephen Day. It’s due out in Autumn 2010 from Atomic Diner. Author Christopher Fowler and I are running a horror story story competition called the Campaign for Real Fear. We’re looking for 500-word stories that convey the fears and diversity of 21st century life – all are welcome to enter. The deadline for entries is 5pm GMT on the 16th of April 2010. I’ll be a guest the Irish sf convention P-Con from 5-7 March 2010 in the Central Hotel in Dublin. The podcast of my short story “The Tamga” is now available as issue 178 on Pseudopod, read by the talented Cheyenne Wright. Issue 12 of M-Brane SF, which was guest-edited by Rick Novy, has been released. It contains my sf story “The Secret Names of Buildings”. Pseudopod, the horror fiction podcast, has bought the audio rights to my short story “The Tamga”, which was first published in Shroud Magazine last year. Issue 9 of M-Brane SF has been released. It contains my horror sf story “Empty Mind Came Back with the Pearl”. “The Secret Names of Buildings”, my near-future sf short story has sold to M-Brane SF magazine, and will appear in issue 12, which is being guest edited by Rick Novy. I was part of the jury for the Film Pitching Competition at the Galway Junior Film Fleadh, on November 12, 2009. My short weird script, “Training Room”, is being shot as part of the Hotel Darklight anthology film, in conjunction with the Darklight Festival. It’s being directed by Conor McMahon. The entire collection of ten films, which are themed around the location of a hotel, will be premiered on Saturday, October 10, at 9.30pm at the Light House Cinema, in Dublin. Irish sf convention Octocon (10-11 October 2009) has launched the First National Irish Science Fiction Film Awards, called The Golden Blasters. Filmmaker John Vaughan is putting together the programme of short sf-themed films from around the world. Guest of honour Mike Carey and I will be the judges for the award. I’m co-writing a three-issue comic book, called Róisín Dubh, with Rob Curley of Atomic Diner publications. “Empty Mind Came Back With the Pearl”, my horror/sf tale featuring a multiverse war, has sold to M-Brane SF, and will appear in issue 9. My story “The Garden of Death”, inspired by the painting of the same name by Finnish artist Hugo Simberg, has been chosen as a top ten finalist in Fantasy Magazine‘s Micro-Fiction Contest. A readers’ poll will decide three winners, which will be podcast. Issue three of the electronic magazine Arkham Tales has been published, and it contains my short story “The Diet” – a story in the Lovecraftian tradition. It’s available for download in two formats: .pdf for web viewing or .pdf for printing. Issue 13 of Paradox: The Magazine of Historical and Speculative Fiction is now available. It contains my short story “Beautiful Calamity”. Another one of my twitter stories has been published on Thaumatrope. Issue 10 of British horror magazine Black Static is now on sale, and contains my short story “Vic”. On April 19th I will be in conversation with Kim Newman in front of a public audience at the IFI in Dublin, discussing the variety of screen adaptations of Dracula, as part of the IFI’s weekend season of Dracula films. You can read my twitter stories here and here on Thaumatrope, as well as my pico story on Outshine. My poem, “Exchange“, is online at Goblin Fruit, in the Spring 2009 edition. I’ll be attending the 60th British National Science Fiction Convention Eastercon LX from April 10-13 2009 in Bradford, Leeds. I’ve posted my schedule on my blog. I’m a Guest at P-Con in Dublin from March 27-29th, and I’ve posted my schedule on my blog. My poem “The Solace of Dark Places” has sold to Goblin Fruit for its Spring 2010 issue. Tim Deal, the editor of Shroud Magazine, is buying my short story “The Tamga” for issue number six. It will be the first edition of Shroud to be distributed throughout the USA via the Barnes and Noble bookstores. My short story “Bone Mother“, is now available as a podcast on Pseudopod, read by the awesome Cat Rambo. I’ll be interviewing Kim Newman on the subject of “Writing Horror” for members of the Irish Playwrights and Screenwriters Guild on March 26, 2009, in Filmbase in Dublin. Jetse de Vries bought one of my pieces of twitterfic for his picowebzine Outshine. It will be twittered in April. Thaumatrope, a new market that twitters stories that are less than 140 characters long, has bought six of my teeny stories. They will be twittered throughout 2009. My short story, “Beautiful Calamity”, will appear in issue #13 of Paradox Magazine. Pseudopod, the horror story podcast, is buying the audio rights of “Bone Mother”—my short story originally published in the Fantasy anthology edited by Sean Wallace and Paul Tremblay. On November 25th in Dublin I’ll be participating in a conference, organised by the Irish Arts Council, entitled New Media, New Audience? The event is designed to discuss how new social networking technologies can help promote the arts, and I’ll be on the 11.30am panel entitled New Media in Practice. “Bone Mother”—my short story published in the Fantasy anthology—received an honourable mention in the The Year’s Best Fantasy and Horror 2008: 21st Annual Collection. My poem “Exchange” will appear in the Spring 2009 issue of Goblin Fruit. A new online magazine, Arkham Tales, has bought my short story “The Diet”. My poem, “Grave Taster”, placed second in the Doorways Magazine annual poetry competition. It will appear in Doorways Magazine #8. Doorways Magazine has accepted my short story “Water” for publication in a forthcoming issue. My story “Moments on the Cliff” will appear in a forthcoming edition of All Hallows, the journal of the Ghost Story Society. UK horror magazine, Black Static, is buying my short story “Vic”. I’ve been invited to be a guest at Phoenix Convention 2009. My flash short story, “Homunculus”, will appear in the September 2008 edition of Aoife’s Kiss. I completed the FÁS Screen Training Ireland certified course on Scene Analysis, taught by Beth Serlin. Fantasy & Science Fiction columnist Dave Trusedale compiled a Recommended Reading List of short stories from original anthologies published in 2007, and placed my short story “Bone Mother” among the shortlist. Shroud Magazine is buying my short story “Home”. It will appear in the second issue. My poem, “Tattoo Destiny”, has sold to the Jabberwocky 3 anthology, ed by Sean Wallace. My short story, “Bone Mother”, appears in the anthology entitled Fantasy edited by Sean Wallace and Paul Tremblay, July 2007. My review of the Irish film, Isolation (Billy O’Brien, 2006), appears in the Halloween 2006 edition of the Irish Journal of Gothic and Horror Studies. I attended the Clarion West Writers Workshop, in Seattle, USA (June 18 – July 28 2006). Cabinet des Fées bought my short story “In the Woods”, and it appeared in the journal’s first print edition. The Winter 2005 issue of Film Ireland contains my book review of The Story of Irish Film. An article on the Star Wars saga featured on Sigla, the Irish online magazine (May 2005). “Who Hears our Cries in Forgotten Tongues?”, appeared in the online magazine, Flash Me Magazine, in October 2004. Read it online.